Konkan Railway Corporation Limited (KRCL) has recently conducted the Group D written test in many examination centers. Hopefuls seeking to get railway jobs in Konkan Railways have competed for the Group D written test as per the scheduled dates. The KRCL has taken a major care to conduct the Group D examination in many examination centers across Maharashtra. Many of the aspirants have competed for Group D examination this year. The KRCL has released the Group D answer keys for the conducted exam after a few days of the examination. Candidates who have not yet verified the answer sheet can check it from the Konkan Railways official website, konkanrailway.com. Here is an update regarding the Konkan Railway Group D exam result 2018. Candidates can stay following this article for details. Konkan Railway Corporation Limited (KRCL) is the union government organization that was headquartered in Navi Mumbai. The KRCL yearly issues various job notifications to hire suitable candidates into various jobs. KRCL has recently rolled out a recruitment notification “Notification No. CO/P-R/ 05/2018” for 100 Group D posts include PointsMan, Trackman, Assistant Khalasi- Electrical, Khalasi- Mechanical & Khalasi S&T. Many of the suitable and interested aspirants have applied from 22nd May to 21st June for the announced vacancies. The selection of suitable candidates will be done through written test and interview rounds. Candidates selected for Konkan Railway jobs will get good pay scale as per the norms. 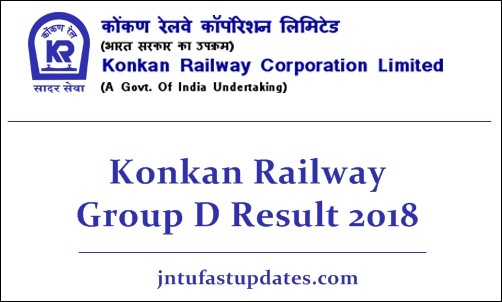 Konkan Railways is expected to release the results of Group D examination shortly on its official website, konkanrailways.com. The competitors who have competed for the test can stay checking the KRCL official website regularly for more updates. In the general scenario, the KRCL will release the results within 3 to 4 weeks. Soon it is going to notify the result date on KRCL website. The competitors can also expect the cutoff marks and merit list along with the results. KRCL will announce the cutoff marks for the Group D examination for all categories such as general, OBC, SC, ST, and others. The KRCL Group D Cutoff marks/qualifying marks will also be announced section-wise. Candidates have to score the marks both category-wise and section-wise to clear the examination and to promote for the next round. Candidates who have scored the marks as per the announced cutoff marks will be listed in the merit list. Wait for the update regarding the result date. The KRCL will announce KRCL Group D result, cutoff marks, merit list. On the homepage, ‘Group d result 2018’ link will appear. Enter the required details such as login id, password etc. What is the expected cutoff for krcl group D?